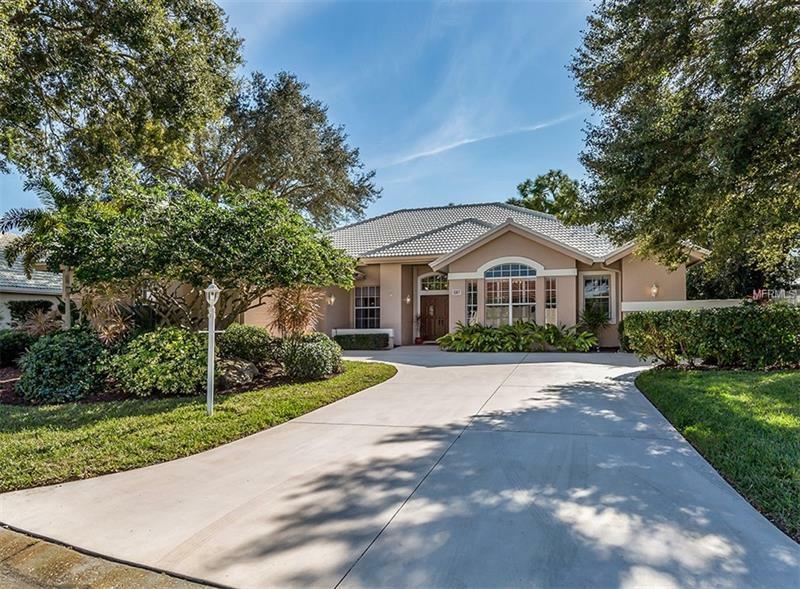 Welcome to Venice Golf and Country Club, a gated, planned community nestled amid an award-winning Certified Audubon Geo Certified Sanctuary boasting 26 lakes, 13 natural preserves and a canopy of oaks, pines and palm trees as you enter the gate. This charming 3 bedroom plus a den custom residence exudes elegance and comfort with southern exposure and panoramic views of the 5th fairway speckled with lakes and bunkers. The drama begins in the magnificent entryway which transitions into an open great room plan with volume ceilings, ideally set up for entertaining. Tiled and laminate floors flow throughout while large windows and sliding glass doors bring in the beautiful natural light. The kitchen is poised to be a part of the action with granite counters, propane for cooking and plenty of cabinets. Host memorable evenings serving dinner in the dining room then move outside to the lanai with your heated pool and spa enjoying beautiful sunset hues and warm Gulf breezes. The spacious den provides space for checking off your to-do list, computer work or a cozy hide-a-way for watching the evening news. Oversized garage has room for your vehicles, golf cart, bikes and plenty of storage. Recent upgrades include a new roof in 2009, freshly painted interior, 14 seer, 3.5 ton AC in 2012. Located minutes to your choice of area sandy beaches, shopping, dining, bike trails, fishingâ¦your choices are endless. Welcome to Paradise! Club Membership Mandatory. Furniture available under separate agreement.